The integrated Google search is kept. It allows you to type in any location in South Africa, and the system will search for properties in a radius around that point, allowing buyers to find more listings in the same area. A neighborhood feature highlights selected areas and gives insight into popular areas in South Africa including photos, map, latest listings and agents. This is already the largest selection of neighborhood info and photos for a South African portal, and we are hoping to expand this further for 2019 including enhancing the info we provide per area. Connect with a neighborhood expert, features agents that were picked from our unique Neighborhood Expert program that we are busy launching and aims to promote top agents in areas. At the end of 2018 more than 200 agents submitted their initial area expertise which was loaded on the portal, and prominently features the agents in their respective areas. We will soon open more functionality and allow agents to interactively submit their local area knowledge. We value the role of the agent, and why we are the only portal with an agents only approach! 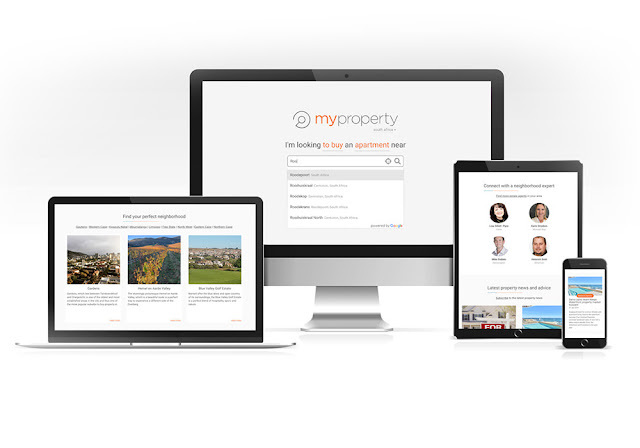 The latest property news is also featured on the home page. New property news is loaded daily on our portal and we encourage you to subscribe or follow us on Twitter and Facebook to stay updated and join in the conversation. Also check out our popular Instagram account! Check out the updated home page and watch our for more features rolling out soon! And for the record, MyProperty is still independently owned by Entegral, read more about our core values and mission here.